By Amanda Glenn 10 Comments August 6, 2018 This post may contain affiliate links. M&M cookies are my favorite – so what could be better than M&M cookies that make you more breast milk? 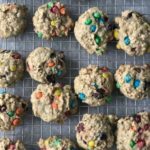 This Chocolate Chip and M&M Lactation Cookies recipe has three galactagogues – brewer’s yeast, flaxseed, and oatmeal – along with plenty of chocolate to make them taste delicious. These cookies are really easy to make, with the only possible hiccup getting your hands on some brewer’s yeast. I’ve tried a few times to get it locally but have never been able to find it. (One health food store had tablets, but not the powder.) I got it on Amazon (here’s the one I bought), which might be easiest. I had two recipes (this one and this one) that I used for inspiration, and I ended up making three batches of cookies – I made each recipe on its own once to test it out, and then made some tweaks of my own. 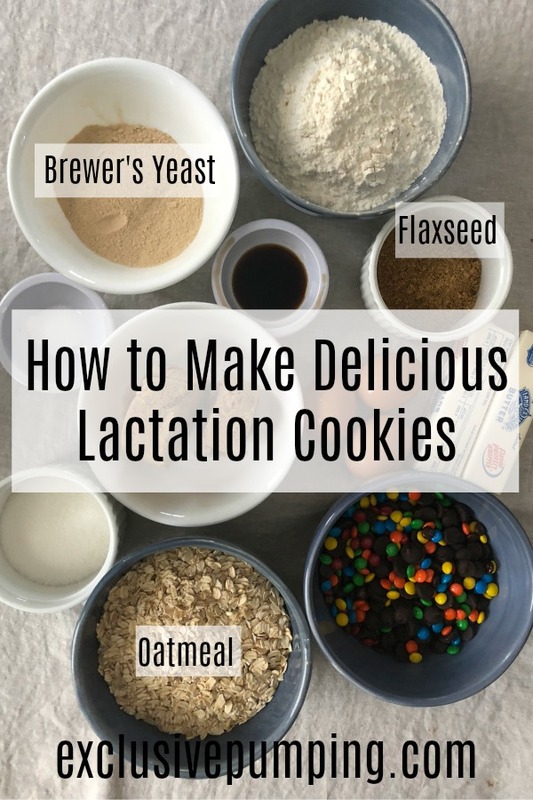 My main changes were to increase the brewer’s yeast and flax seed to crank the galactagogue power up for increasing milk supply – and then seeing if that made the cookies taste any different. I made these with both baking-sized M&Ms and full size, and I preferred the full-sized ones but either will work. Also, the recipe calls for a 1:1 ratio of chocolate chips and M&Ms, but you can do all chocolate chips, all M&Ms, or whatever ratio you want! 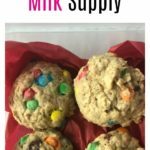 Love cookies and want to increase your milk supply? 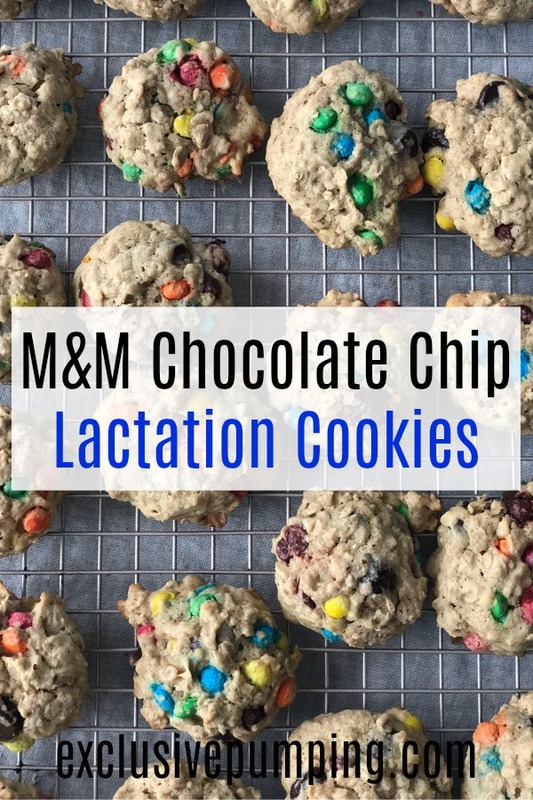 This Chocolate Chip M&M Lactation Cookie recipe uses brewer's yeast, oats, and flax seed to boost your milk supply, with plenty of chocolate to make sure the cookies taste delicious, too! Add water to ground flax seed, and stir together until mixed. Set aside. In an electric mixer, cream butter, sugar, and brown sugar. Add flax seed mixture, flour, brewer's yeast, baking soda, and salt. Mix until well combined. Fold in oats and stir. Once the oats are well combined, add M&Ms and chocolate chips. Place spoonfuls of dough onto a baking sheet. Bake for 10-13 minutes until the edges are starting to brown. After removing the baking sheet from the oven, let the cookies rest for several minutes, and move to a wire rack to cool completely. It's fine to use only M&Ms or chocolate chips or a different ratio than 1:1 as long as there are about 2 cups of chocolate. I used a teaspoon size cookie scooper and the recipe yielded 48 cookies. If you make bigger cookies, the cooking time may be longer. Great recipe! These cookies are addicting – bright side is they helped with my supply. I also added coconut flakes and sliced almonds to get a crunch. Thank you for the recipe- keep up the great work! Thank you SO much Tarryn!!!! Tastes good. I’m not sure if it’ll help out, but they’re good cookies regardless! How long do these stay good frozen? I have only tested 2-3 weeks for this recipe, but my understanding is that most cookies can be frozen for up to 6 months! Might be a silly question but how many do you eat a day to notice a difference in supply? Hi Becky! It will be different for everyone, but I would start with 3 or 4? Where’s the eggs in the recipe? Fixed! Thank you so much for letting me know I missed them! I use to drink “healthy nursing tea” which I get from Amazon. this herbal formula is awesome in order to get your supply elevated. a few brands are there with the same title but I use to buy one secretsoftea brand. its an all natural herbal formula that is preservatives free and tastes great.